The Groome Inn is a beautiful traditional southern home from the 1800's in Greensboro, NC just a few short miles from Grandover Resort's spa and golf course. The home was converted into a romantic wedding venue and corporate retreat which hosts beautiful outdoor weddings. Jill and Chris chose the Groome Inn for it's historical feel and the lush garden spaces that surround the property. For their romance session, I wanted to give them a dramatic yet intimate image that really spoke to their personalities and their relationship. We pulled one of the pieces of antique furniture out of the house and placed it on the flagstone dance floor. The grotto lights that surrounded the floor hung down to give a backyard party atmosphere. Chris and Jill took their place on the couch but rather than have them looking straight into the camera I asked them to sit the way they do when they cuddle at home. This was the beautiful result. 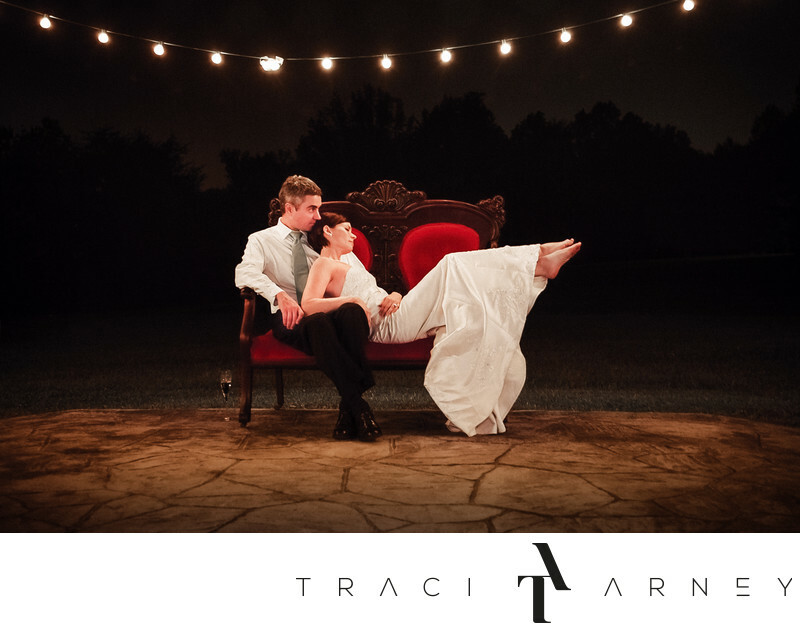 The intensity of the colors, the softness of the light from the string lights, and the ease of their pose give a result of a truly personal and very intimate portrait that is different and exactly what my clients were looking for. Location: Groome Inne, 4719 Groometown Rd, Greensboro, NC 27407, USA. Keywords: Greensboro (231), Groome Inn (6), NC (636), Outdoor (78), Romance Session (87), Wedding (465). 0.6; f/4.0; ISO 640; 50.0 mm.